The PBS program "Need to Know" on May 27 interviewed Harold Brooks, a tornado researcher at NOAA's National Severe Storms Laboratory (NSSL). 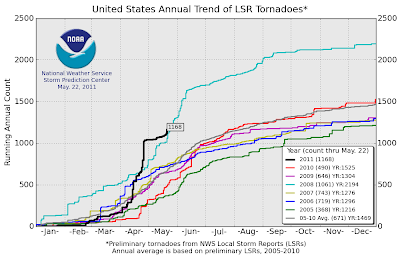 Brooks agreed that 2011 has been an exceptional year for tornado activity, but said that his research has been widely misquoted (click to play). Image (click to enlarge): Tornado touching down near Durham, California, 8 miles SSW of Chico, from KCRA-TV. Midnight Update: The preliminary daily tornado count has increased to 77, including 7 in northern California. WILLOWS NEAR COUNTY ROAD 36 AND U STREET. The bulk of the activity has moved eastward into Illinois, Indiana, and northern Mississippi. 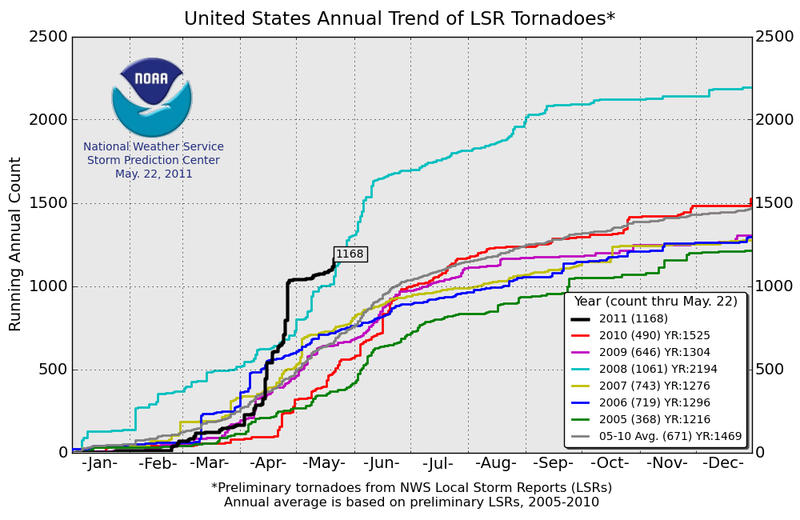 The preliminary monthly tornado total for May now stands at 255. BASEBALL TO SOFTBALL SIZE HAIL ON SOUTH SIDE OF CITY. I-55 SOUTHBOUND ABOUT 4 MILES NORTH OF LOCATION. WALL CLOUD WITH ROTATION AT I-170 AND LADUE ROAD. Numerous tornado warnings are in effect throughout eastern Missouri. Total daily tornado count is up to 20. 2:15 PM CDT Update: The Missouri Highway Patrol reports significant damage in a 4-block area of Sedalia, including a house blown off its foundation; no serious injuries. The focus of attention for later today shifts eastward in Missouri, toward St. Louis. 1:30 PM CDT Update: Fortunately, the immediate Kansas City area appears to have escaped significant damage from this batch of storms, but the Pettis County, Missouri Sheriff’s Department is investigating damage and injuries from the Sedalia tornado. The daily report total is up to 15. The daily report total is now 10. At least 4 tornado touchdowns or funnel clouds were reported around noon local time in the Kansas City area today. They were in Johnson, Jackson and Cass counties of Kansas and Missouri. This brings the preliminary tornado report count for today to 7. May 25, 11 AM Update: Arkansas officials have confirmed 3 deaths in the state from Tuesday's storms. This brings the daily total in Oklahoma, Kansas, and Arkansas to 13. 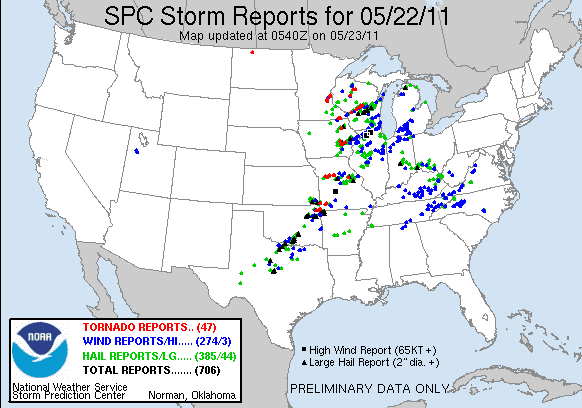 The preliminary total of tornado reports for May 24 is 47. The tornado outbreak has continued into the night in Arkansas, where the town of Denning, population about 270, has been reported destroyed by a large tornado which struck around 12:15 am CDT. Spotter reports indicate that the storm may have been as much a 1 mile wide. 10:30 PM Update: Meanwhile, multiple strong tornadoes today have reportedly killed at least 4 people in the Oklahoma City area and 2 more in Kansas, about 100 miles west of Wichita. The preliminary total of tornado reports today has now reached 24. SPRINGS...MOVING NORTHEAST AT 50 MPH. The National Weather Service has upgraded the Joplin, Missouri tornado to EF-5 intensity, the highest rating, with winds over 200 mph. As of 6 pm CDT, the death toll is estimated at 122 with 750 injuries. This means the storm is the "deadliest since modern recordkeeping began in 1950 and is ranked 8th among the deadliest tornadoes in U.S. history." The path length is still being analyzed, but the path width was 3/4 mile. The death toll is expected to rise, with a reported 1500 people still missing. The NWS also reported that the 1.83" of rainfall at Joplin on May 23 (Monday) was nearly double the previous daily record of 0.98" set in 1978. The monthly rainfall total to date of 6.46" is nearly 70% above average. Climate records for Joplin date back to 1902. 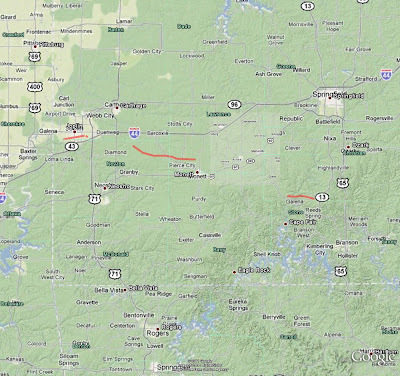 9 PM Update: The NWS reports that the initial storm surveys have been completed and that there are 3 separate storm tracks: the Joplin EF-4 and Galena EF-2, as noted previously, and a second EF-2 in the Wentworth area. (Wentworth is about 30 miles east of Joplin and a few miles south of I-44). Storm track data are still being compiled. The fact that there were 3 storms in the area shows that, as usual, Chad Myers was talking out of his, shall we say, hat, when he was babbling to the Wolfman on the CNN Situation Room that there was only 1 storm involved. WIND SPEEDS WERE ESTIMATED AT 190 - 198 MPH. AT THREE QUARTERS OF A MILE WIDE. 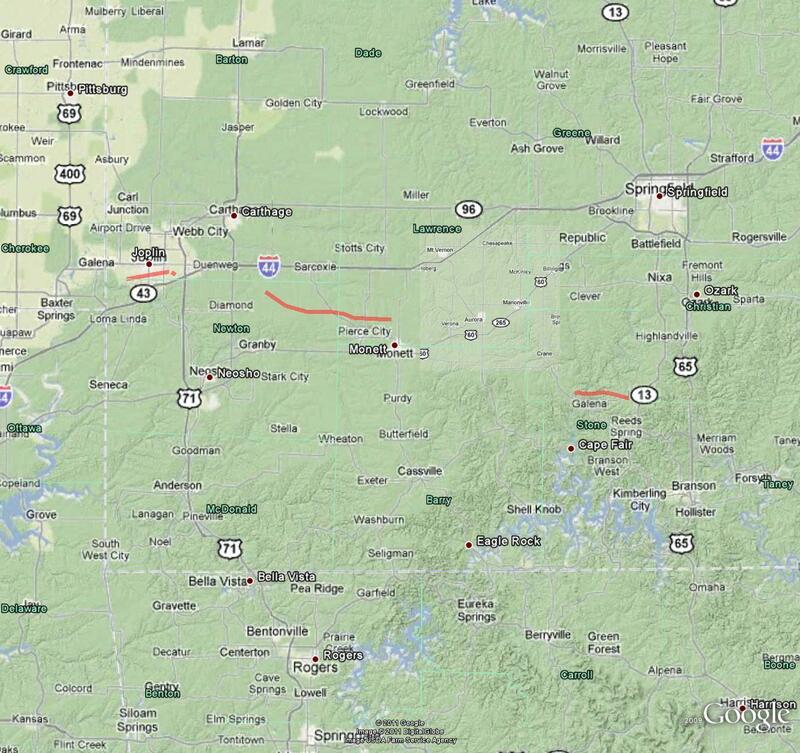 A survey has been completed for another tornado in the Galena area of Stone County, Missouri. 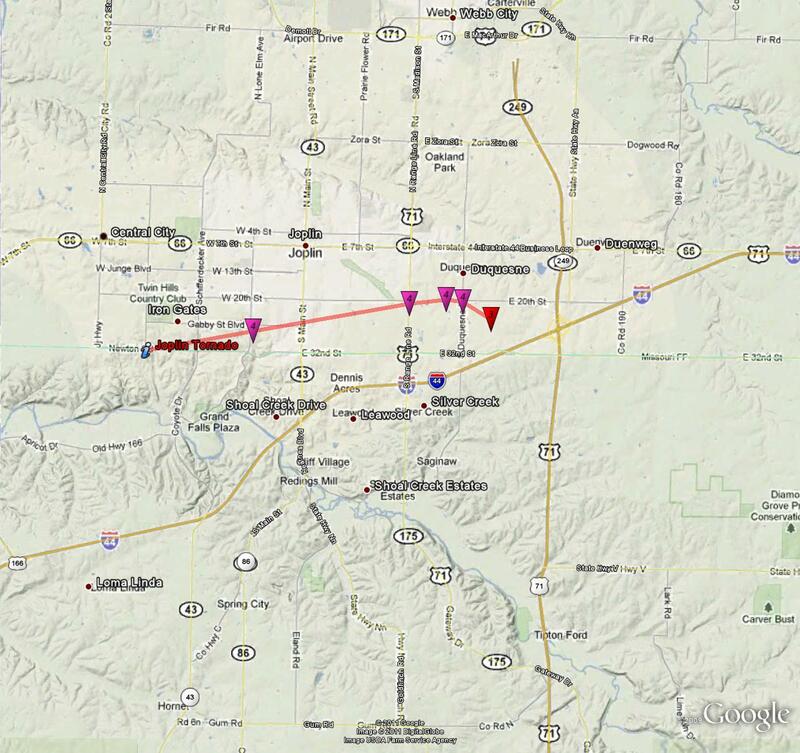 That storm was rated at EF-2, with a path length of 7.25 miles and a path width of 1/4 mile. 4 PM Update: CNN is reporting that the Joplin tornado death toll has risen to at least 116. This exceeds the number from the 1953 storms (see below) and makes it the deadliest single tornado since 1947. An aerial view of the tornado damage from KOTV, Tulsa, Oklahoma, is here. 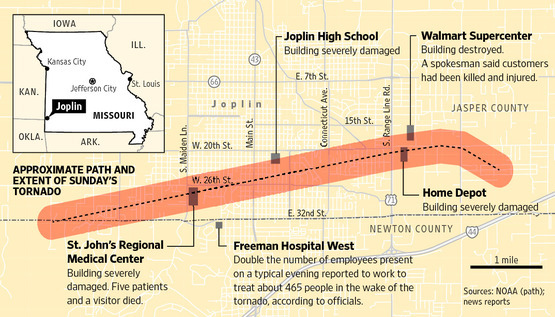 USA Today has links for "How to help victims of the Joplin tornado". The Weather Channel is reporting that this may be at least the Deadliest Tornado Year Since 1953. A supercell thunderstorm tracked from extreme southeast Kansas into far southwest Missouri late Sunday afternoon and evening (May 22nd). This storm produced a strong tornado over Joplin resulting in devastating damage. This storm generated other tornadoes and wind damage along its path as it moved east southeast across far southwest Missouri. Spotty wind damage also occurred across the remainder of far southern Missouri as the storms moved east. Additionally, these storms produced torrential rainfall and flash flooding across far southwest Missouri particularly in McDonald and Barry Counties. The preliminary tornado report count has been updated to 48 for May 22. The preliminary year-to-date total is 1168. 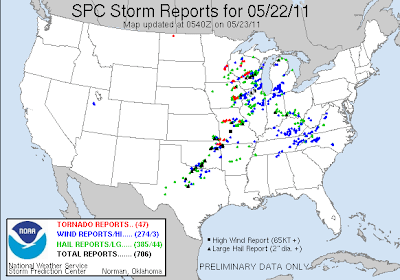 After slacking off from April's record pace earlier in the month, 47 preliminary tornado reports erupted from North Dakota to Oklahoma on May 22 (Sunday). At least 1 fatality and dozens of injuries were reported in Minneapolis. The worst storm appears to have been a multi-vortex tornado which created a damage path a mile wide through Joplin, Missouri, according to The Weather Channel. As of midnight, at least 24 were reported dead in Joplin, with a hospital building suffering massive damage. This followed a deadly tornado in Reading, Kansas on Saturday night (video here). The Kansas storm had a preliminary rating of EF-3. The National Weather Service will be sending at least 3 survey teams in the field on Monday to evaluate damage in the Missouri storm, but initial images of the damage indicate the Joplin event was likely at EF-4 or EF-5 intensity. 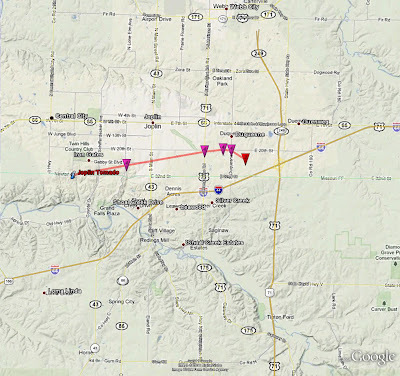 MULTIVORTEX TORNADO REPORTED NEAR 13TH AND RANGELINE RD. REPORTS OF DAMAGE TO NUMEROUS TREES AND HOUSES.